If you have read our "about" page you will see that Rampant Lines is an independently funded student newspaper at J. H. Rose High School. Because of this we are forced to raise money buy selling ad space in our newspaper and collecting donations from generous members of our community. If you are interested in doing either donate or buy an ad please read on and find the downloadable files on this page. We are thankful that you are actually on our site and reading what we have to say. You have no idea how happy we are to receive this generous support! If you choose to buy an advertisement in Rampant Lines then you will not only be giving yourself the opportunity to market you service, product, or business to a close tight nit community of students, faculty, alumni, and residents of the greater Greenville area but you will also be sending them a message that you support public eduction and the journalism department at J. H. Rose High School. J. H. Rose High School student enrollment is more than 1,600. Students are supported by more than 100 faculty members. Rampant Lines will be distributed around the greater Greenville area. Rampant Lines Online has reached an audience of 975 online readers. 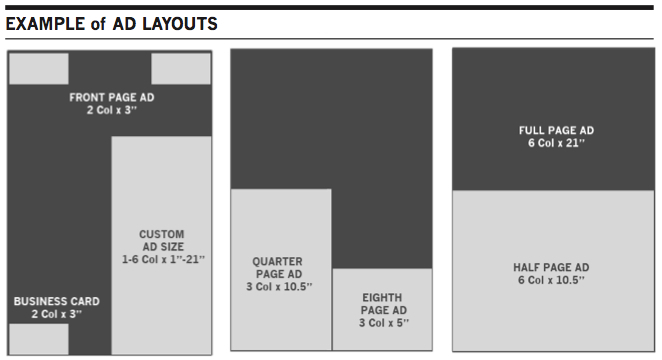 6 column inches x 21"
6 column inches x 10.5"
3 column inches x 5"
3 column inches x 10.5"
2 column inches x 3"
1-6 column inches x 1-21"
30% off for year long ads. Check back later for more discount opportunities throughout the year! Ads on the website come in full color and can be linked to advertiser’s websites or Google Maps for easy directions. We are currently looking for a sponsor who would like to support Rampant Lines with a donation of $1,000. If you are interested in becoming Rampant Lines year long sponsor you will see your businesses logo on the home page of our website next to the Rampant Lines Logo. Not only will you receive an increase in traffic to your website but you will have a larger sense of community respect for your support of eduction. If you would like to advertise with us please follow the five easy steps outlines below. If this causes any problems for your or raises any questions for you please send all emails to rampantlines@gmail.com directed towards the business staffer. We will get in touch with you ASAP. Also, feel free to use this email as a source of contact about any questions you may have about anything to do with our publication including the advertising process. STEP 2. Let us know. Once you have filled out the advertising contract avalible for download above (in step one) we will need that copy sent to us. You have a few options here. You couls use the old fashioned snail mail, and send us the document signed to 600 W. Arlington Blvd. Greenville, NC 27834 directed towards "Rampant Lines Business Staffer." You could also give it to a Rampant Lines Staffer in person. Or you could send us the document through e-mail to rampantlines@gmail.com with "Rampant Lines Business Staffer" as the subject. Once we get the forms we will notify you preferably by e-mail but if necessary through phone, fax, or worst case scenario: snail mail. We will also need the actual advertisement that you want us to print. If you will be sending us the file through email, please follow the guidelines listed below. File format: While we prefer PNG or JPG files, Rampant Lines will accept all of the following: Illustrator CS, Photo- shop CS, InDesign CS, JPG, TIF, and PDF. If you have questions about file format you can contact your Rampant Lines sales representative or e-mail us at rampantlines@gmail.com. Sending ad files: You may send in your ad through e-mail or physically hand in a copy of the ad you wold like printed to a Rampant Lines staffer. Please send all print ads to rampantlines@gmail.com. If you would like a Rampant Lines Staffer to design the advertisement for you that can be arranged as well. As you can see from our publication graphic design is one of Rampant Lines staffers many different strengths. Any staffer will be able to assit you in this area and would be glad to help. Please send any inquiries to rampantlines@gmail.com. We will request the money for the rate you have requested once we receive your signed forms. We will then notify you once we receive your money order and will begin placing your advertisement in the publication. After the paper has been printed we will then send you a proof of print with your actual ad printed in the paper.